How many of you heard of Cirque Du Soleil? Almost everyone who is interested in creative shows know about this huge company that started in Canada and now have permanent and touring shows all over the world. I saw a few spectacle of Cirque Du Soleil: Quidam was the first one and as far as the story and the music go, it still is very dear to my heart. However the one that truly blew me away is the permanent show in Bellagio in Las Vegas: "O". Anyways, this great group of extremely creative, talented and athletic people are gearing up for a permanent show in the heart of Hollywood, in the official home of Oscars, Kodak Theater. Guess what the show will be about? Iris will start its preview run on July 21st and it will have its official opening in September. Your very well connected friendly photographer here was able to get an admission for the run thru they had and I was able to see the entire show! After the show, I had a chat with some of the cool cats on the production side of this and learned that they will change many things within two weeks as they would like the second half to be "better". These international perfectionists do realize that they have something good in their hands and they are fine-tuning it before they make it completely available to the public. - There is almost a trademark of Cirque Du Soleil: extremely flexible girls, and as usual they do not disappoint. - A number involving a group of Asian men in "bee" costumes is absolutely stunning. - A number called Noir (The Chase) is also ridiculously fun to watch and transforms to a gorgeous romantic piece at the end. - There is A LOT happening. As the show tackles a very visuaal medium, what you see on the Kodak Theater's stage is very rich. Performers are in front of a multi-layered screen and light, shadow and film is superposed with the entire live act. 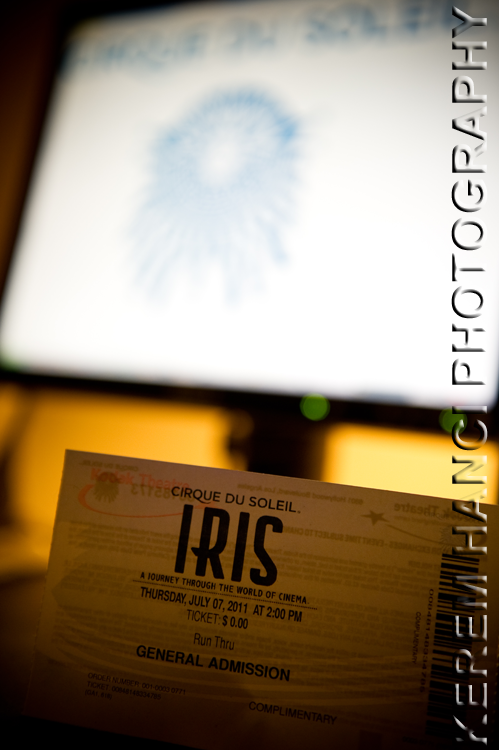 Cirque Du Soleil also tries its hand in scripted comedy in Iris, and I thought it was slowing down the pace of the entire show. Although there were some cute elements in these scripted and spoken pieces, I didn't think it was adding much to the show. Overall, Iris is something that every Angelino should see. The tourists will see it anyways. Cirque Du Soleil has a 10-year contract with the Kodak Theater. They will exit for 2 months to make way to the the Oscars every year, but other than that, you have a lot of time to catch it. For more information, visit the official site of Iris.